When French girls get together | Turning my world upside down! Thursday night, a bunch of the French teachers got together for a little celebration. Call it the end of the semester, call it a bon voyage trip for one of the girls going home to France for her holidays. No matter, French teachers know how to party! 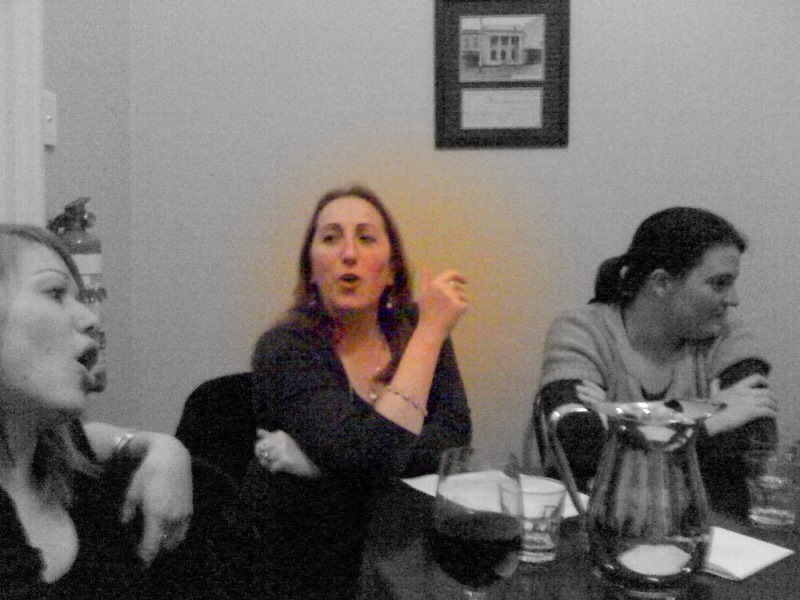 We met for drinks and dinner at the Wine Bank, a local restaurant on View Street, in Bendigo. It used to be a bank and has been converted to a lovely restaurant where you can use a private room, order wine by the glass or bottle and sample some bistro cooking to match your local wine. The guests were either current or former French teachers from diverse parts of the world. Dolly is Lebanese, both Maries are from France, as are Laurette and Sara. Barbara is from Quebec City (like me) and has lived and taught here for over 30 yrs. 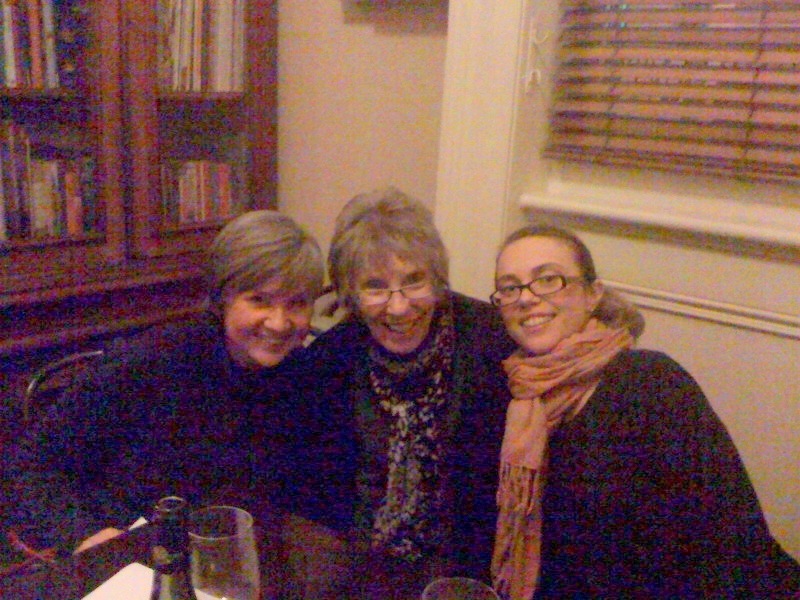 Jane, Tarlie and Marion are Australian. You can imagine the interesting variations of accents you hear at the dinner table. 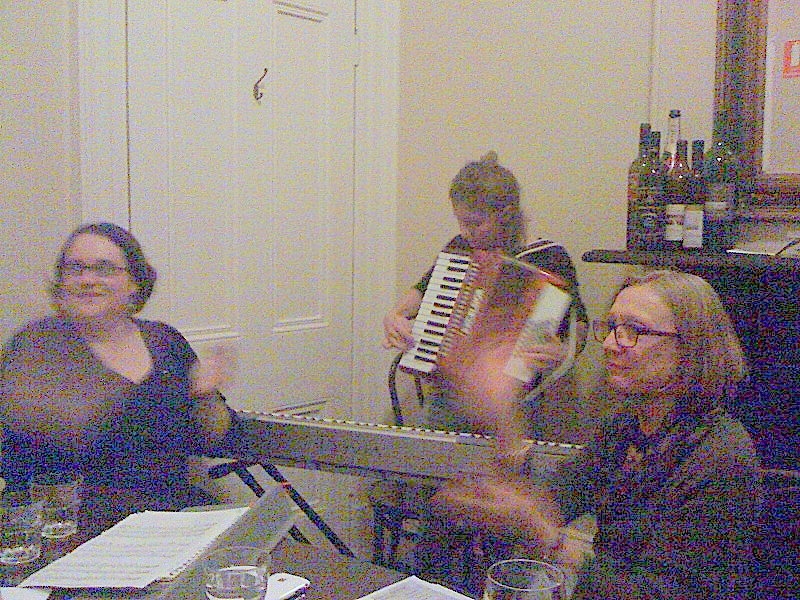 Marie and Sara brought along their instruments for an old fashioned sing along. It didn’t take long for all of us to join in. Marie T. even started playing the spoons to provide a little percussion! What a fun night! The food? It was hardy and delicious. I ordered chicken and barley soup which was more of a stew. Along with the cheese and appie sampler the table ordered, there was plenty of good food to try. We shared a few bottles of wine, among which was a Marong Shiraz 2008. Not bad, but I often find sedament at the bottom of the local wines. Just an observation, mind you. After sitting by the wood fire for a few hours, chatting, singing and acting like the “bon vivants” we are by our French nature, I was happy to report I was warm for the first time in weeks. Let’s hope the glow lasts. Seeing how it’s the first day of summer, I thought I’d look up what I was doing around this date in 2011 while on exchange in Australia. It was well into winter there, mind you. Enjoy!